I had almost forgotten the taste , when recently had the pleasure of having at a friends place. Thanks Shalini for the perfect recipe. I made it and was a instant hit. 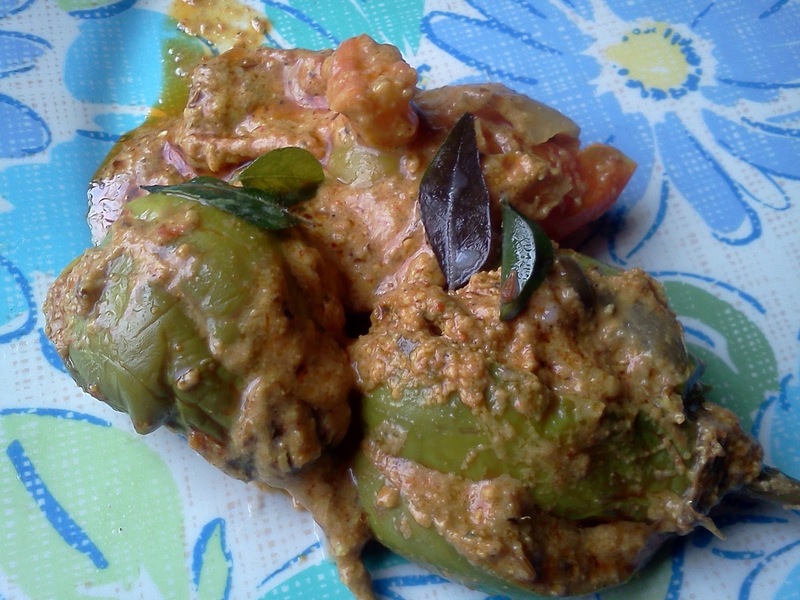 This is a variation of the famous Andhra Delicacy Gutti Vankaya koora. 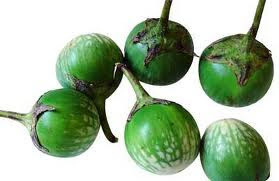 / tumbu gayi of Karnataka.The crux of it all is Poluru Vankaya or Poluru brinjals which are tiny green brinjals which just melt in the mouth when cooked., and an amazingly tasty dish is ready with the right kind of recipe. It is extremely tasty with Rotti or Chapati , but as tasty with hot rice and some ghee to go with it. Dry roast the below ingredients and grind together with a little water. Add a little oil and the filling is ready. Wash and dry the green brinjals with the stems on. Cut the brinjals in a Plus shape at the round ends all the way to the down but do not chop them apart. In a pressure cooker add a 3 spoons oil. When its hot add mustard , let it splutter .To this add cumin and curry leaves. When cumin turns reddish place a layer of onions.. above this place a layer of tomatoes and place the brinjals on top of the tomatoes. Add the water and the left over masala and cook for 15 minutes of three whistles. Serve the brinjal carefully with a large sized spoon and enjoy with hot Bhakri/ Jolada Rotti or Chapatis. ooohhhh!!! tastes ultimate with jolada rotti. The recipe is simple. Will try it soon.